One of the best delights on any holiday is letting your taste buds do a little wandering of their own. When you dine in the Caribbean, you’ll certainly find hamburgers, steaks and fish and chips on the menu, but you won’t get the full flavour of your holiday if you stick to your old standby meals. Every corner of the Caribbean has its very own unique treats and one-of-a-kind taste sensations, so make sure to broaden your horizons and sample some of the great dishes in whatever country you are visiting. Over more than two centuries of exploration and conquest, everyone who has ever come to Jamaica has left a taste imprint on this sunny island nation. Conquered by the Spanish, settled by the British, and worked by Africans, Chinese and Indians; everyone brought their flavours and influences, which have blended together to make up Jamaica today. You can taste the African influence in the spicy fire of Jamaican “jerk” chicken or pork. Curries are a popular dish, made with chicken or goat. Don’t forget to enjoy a Jamaican patty, a hybrid of British and Jamaican flavours with spiced meat and potatoes wrapped in a fluffy pastry! For breakfast, skip the eggs and enjoy some homemade ackee and saltfish, or freshly baked coco bread. Further reading: Jamaican cuisine is an exotic amalgamation, influenced by cultures from all four corners of the globe. Barbados flavours rely heavily on a blend of spices known as Bajan Seasoning, and of course, you’ll often find a bit of rum blended in. On a visit to beautiful Barbados, sample the national dish of Cou Cou and Flying Fish – try heading out one evening for Oistin’s Fish Fry. Cou cou is a mix of cornmeal, okra, peppers and Bajan hot sauce, serve with fried or steamed flying fish, which are so plentiful in these waters. You can also order Pie and Fish, which would be flying fish with a side of rich and tasty macaroni and cheese. Make sure to try candied sweet potatoes, which are baked with lots of locally grown brown sugar and served with pineapple. Another sweet treat are fried plantains, sprinkled with cinnamon. Further reading: A tropical blend of old and new, the local cuisine in Barbados brings together a combination of flavour sensations from all across Europe, Africa and the Caribbean to create a unique culinary experience revelled by almost everyone lucky enough to sample it. Montserrat has a strong Irish influence and is often called the Emerald Isle of the Caribbean. Many of the island’s original settlers were Irish workers escaping persecution on nearby islands, and today, Montserrat is the only place in the world, outside of Ireland, that celebrates St. Patrick’s Day as a national holiday. So, it’s not surprising perhaps that the national dish here is a stew with dumplings, albeit with the Caribbean twist of being made with goat. Goat water stew is a unique twist on Irish stew and it is utterly delicious. Nearby St. Lucia has a distinct French influence in its flavours, having changed hands between the British and the French fourteen times. 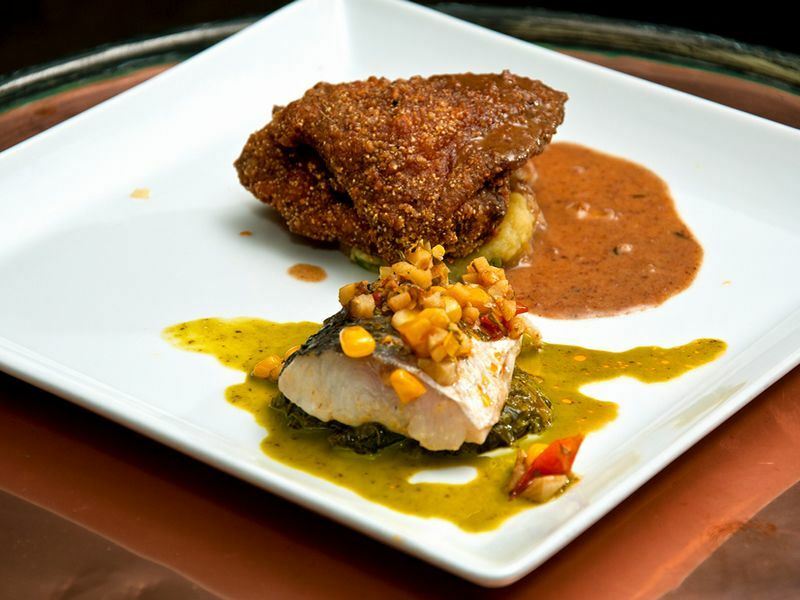 The food here has a distinct Creole influence, with touches of Africa and the West Indies. Try the pepper pot stew in St. Lucia, made with beef, sliced peppers and lots of other local fresh vegetables. Another delightful dish in St. Lucia is the callaloo soup, made with callaloo (a local leafy vegetable), beef and coconut milk, and topped with fresh dumplings. Further reading: Heavily influenced by West African, British, French and East Indian cuisines, the flavourful gastronomy of St Lucia is a treat you won’t want to miss out on. Food in Antigua leans to the spicy! To cleanse your palate, look for black pineapple (which is just super sweet local pineapple) and green figs (which are bananas). The made dish here is salted codfish, served in a tasty fresh tomato sauce. For some real local flavour, pick up a freshly made roti at a roadside stand, stuffed with delicious curried beef and potatoes. Another popular local dish on many menus is called Fungi, which is a cornmeal and okra mix, often served as a side dish with stew. You should also try souse, which is a pork dish, marinated in lime juice, onions, spices and peppers. Of course Mexico has fantastic Mexican food, but on a holiday to Cancun, don’t limit yourself to the traditional Mexican dishes you have had at home! There is so much more to Mexican flavours than just guacamole and tortilla chips. Skip the massive hotel buffets and seek out some local Yucatan cuisine, where you can try pescado a la Tikin-Xic (fish), or tacos of cochinita (pork), which are both marinated with local spice known as achiote, sour orange and red onion and black beans. For a refreshing drink on a hot day, try chaya, a local juice that has been consumed since the days of the ancient Maya. Further reading: Although many of us consider ourselves to be familiar with Mexican cuisine, the food served up in many Mexican restaurants throughout Europe doesn’t even come close to what the locals cook and eat in Mexico.